An exciting new development for Lay Carmel in Europe! The British Province of Carmelites is pleased to be supporting the development of Lay Carmel in Belgium. In 2011 a Lay Carmelite community in Antwerp approached the British Province, asking for pastoral support and oversight of their development. The Province was delighted to undertake this responsibility, and looks forward to the continued growth of Flemish Lay Carmel which has a long and venerable history. Antwerp (Antwerpen in Dutch) is the home city of the first Lay Carmelite community of the Ancient Observance in Belgium in modern times. Antwerp's skyline blends the medieval and the modern. 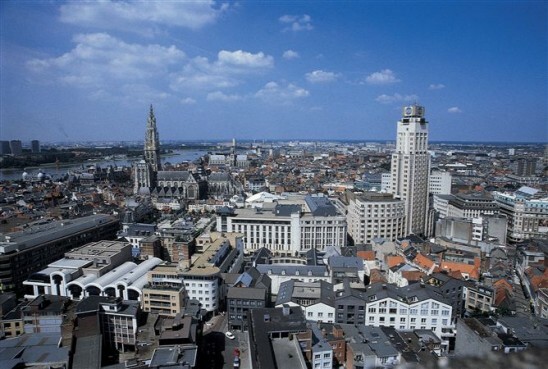 Antwerp is the second largest city in Belgium, about an hour's drive from Bruges. It has a population of half a million. The city boasts the second largest harbour in Europe (after Rotterdam), and is the diamond centre of the world. Historically the Carmelite Family has been very active in Antwerp. probably around 1617-20 when the artist was working in Antwerp. Today a Lay Carmelite community meets on a regular basis in Antwerp, and visitors are welcome. To email Miguel please click here. 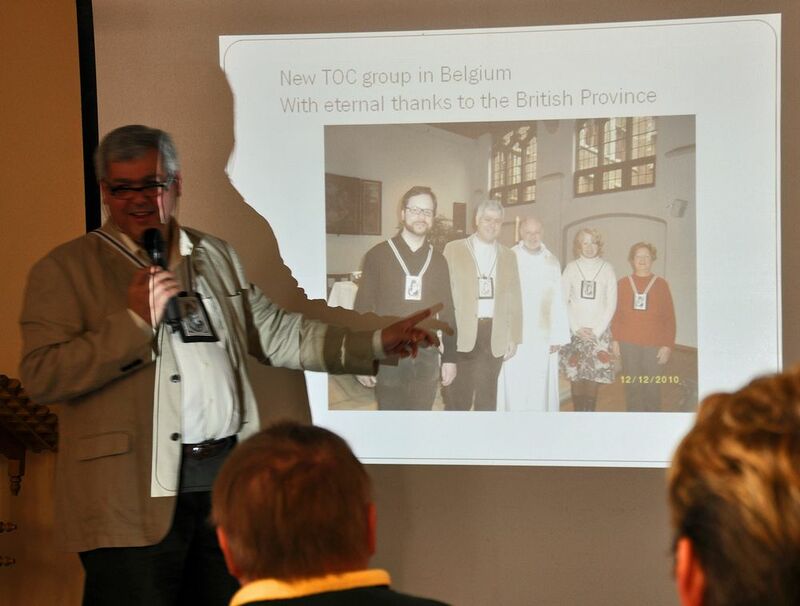 In the Spring of 2011 the British Province of Carmelites agreed to support the development of a Lay Carmelite community in the Belgian city of Antwerp. Following conversations between the community and the British Province, the link was announced at the National Gathering of the Carmelite Third Order held at Aylesford Priory between 6th and 8th May. The Carmelite Third Order was particularly vibrant in the Low Countries in the seventeenth and eighteenth centuries. Flemish Lay Carmelites such as Venerable Maria Petyt became renowned as great mystics whose writings are still appreciated by the Order today. Sadly Carmel declined on that part of the Continent following the Napoleonic wars, and Lay Carmelite communities died out completely during the nineteenth century. Isolated members of the Third Order remained in Belgium, however, and in 2007 one of these, Miguel Norbert Ubarri, was approached by some friends who were interested in knowing more about Carmel. Miguel, who joined the Third Order in his native Puerto Rico in 1988, is Professor of Spanish Literature at the University of Antwerp, and has a particular interest in St. John of the Cross and Jan van Ruusbroec. Soon Miguel was approached by further enquirers, including Koenraad Janssen, a candidate for the diocesan priesthood who wanted to join the Carmelite Family as a tertiary, his mother Mariette Janssen-Cré, and former teacher Chris Torfs. They were received into the Third Order in December 2010. Members of the Antwerp Lay Carmelite Community on the day three of them - after two years of discernment - began their initial formation, on 11th December 2010. They are (left-right): Koenraad (seminarian), Miguel, Fr. 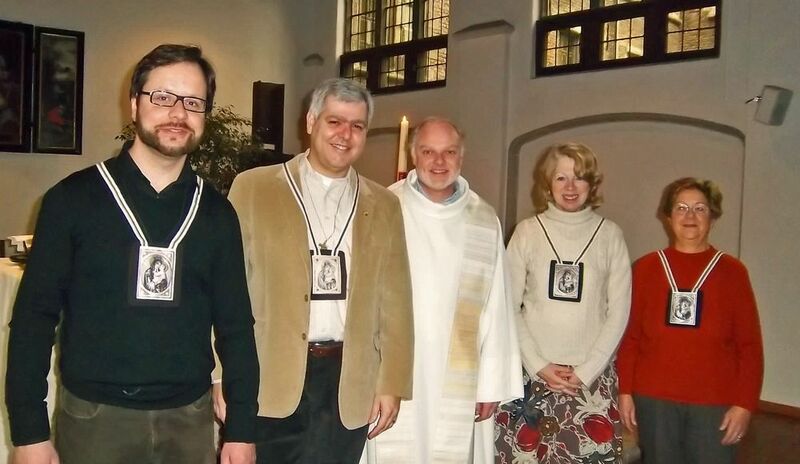 Michel Brasseur (a diocesan priest who gave them their reception scapulars), Chris and Mariette. The Catholic Church in Belgium has recently suffered serious fallout from clerical abuse of minors, and it is hoped that the new Lay Carmelite community can, in a small way, be part of the spiritual renewal of the Church in that country. A small community having developed, Miguel sought to have it canonically (legally) attached to an existing Province of the Order that can provide it with pastoral support and oversight. As a member of the Carmelite Order’s International Commission for the Laity, Miguel was in a good position to approach a number of different regions within the Order, but unfortunately none was able to take on the responsibility. Knowing that the Third Order in the British Province has undergone a great period of reform and renewal in recent years, the Order’s General Councillor for Europe, Fr. John Keating, then suggested to Miguel that he contact the Prior Provincial of the British Province, Fr. Wilfrid McGreal, and his Delegate for the Third Order, Mr. John Berry. Following a number of discussions, the British Province was very pleased to accept the request from the Antwerp community that it come under its oversight. The details of the relationship are currently being worked out. 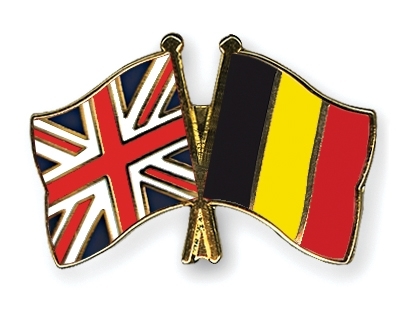 It is hoped that Lay Carmelites from Britain will be able to make occasional visits to their brothers and sisters in Belgium, and visa versa. Quite independently of these discussions, Miguel had been invited over a year ago to be the keynote speaker at the Sixth National Gathering of the Carmelite Third Order. It provided the perfect opportunity for the Prior Provincial to inform the delegates of the new relationship, and Miguel expressed his deep gratitude to the British Province for its willingness to help nurture a new Lay Carmelite community in a neighbouring country.